I can never forget the moment, when I tasted the awesome Puttu Kadala Curry at my neighbor’s home for the first time. A typical preparation belonging to God’s Own Country ~ Kerala, that the recipe has become so synonymous with the state itself. 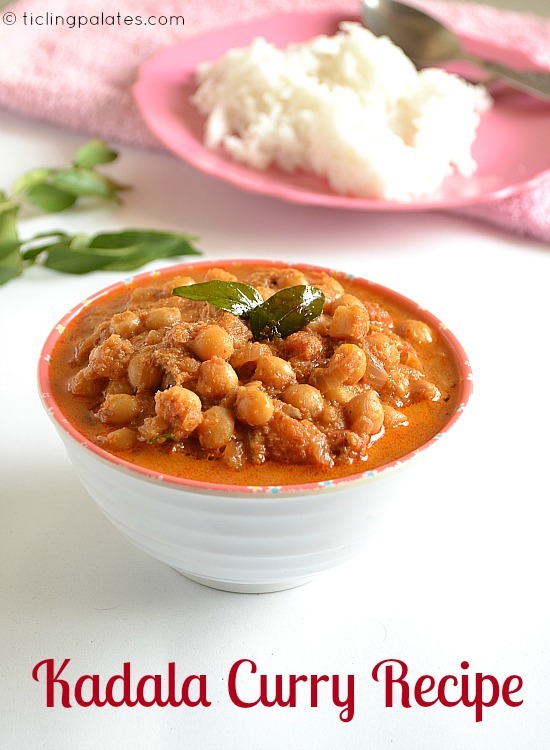 As the Kadala Curry is protein loaded and rich with the coconut gravy added to it, it makes a healthy and nutritious breakfast when eaten with steamed Puttu which is full of carbs. Now that’s what I call a well balanced meal. For this week’s Avant Garde Cookies, we decided to hop to each other’s blog and take a peek into the other cookies blog. It was my turn to take a peek into Roshni’s Kitchen and she being a Keralite, I decided to make the ever famous puttu kadala curry. 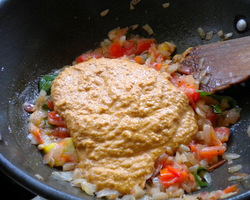 But then I also decided to use whole ingredients to make the paste as that’s how I had seen my neighbor make it. It will be much more flavorful when you roast and grind whole ingredients to make the gravy. 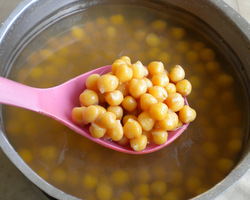 Soak chick peas / Garbanzo beans overnight in enough water. The next day discard the water and using fresh water and 1/4 tsp salt, pressure cook till soft and keep aside. Heat a pan with 2 to 3 tsp of oil. 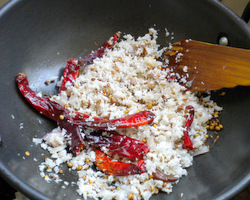 Add coriander seeds, cumin seeds, fenugreek seeds and dry red chillies and roast for a minute. Add sambar onions/shallots and saute for another minute. 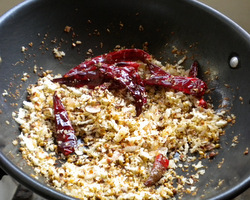 Add the grated coconut at last and simmer the flame completely and keep roasting till the entire contents become browned and aromatic. Take off the pan from stove and let the contents cool. Grind in a mixer using enough water to a fine paste and keep aside. Heat another deep pan with remaining oil. Add mustard seeds and once it pops add cumin seeds, finely chopped onions and sauté till it turns pink. 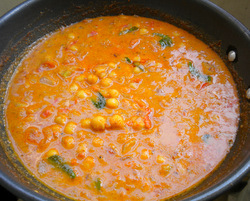 Add tomato, curry leaves and sauté till the tomato softens. 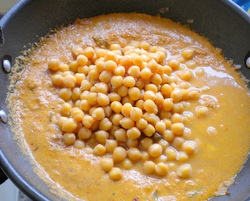 Add the ground paste, cooked chick peas along with the cooked water, salt and mix well. Cover with a lid and cook for 8-10 minutes over medium flame. 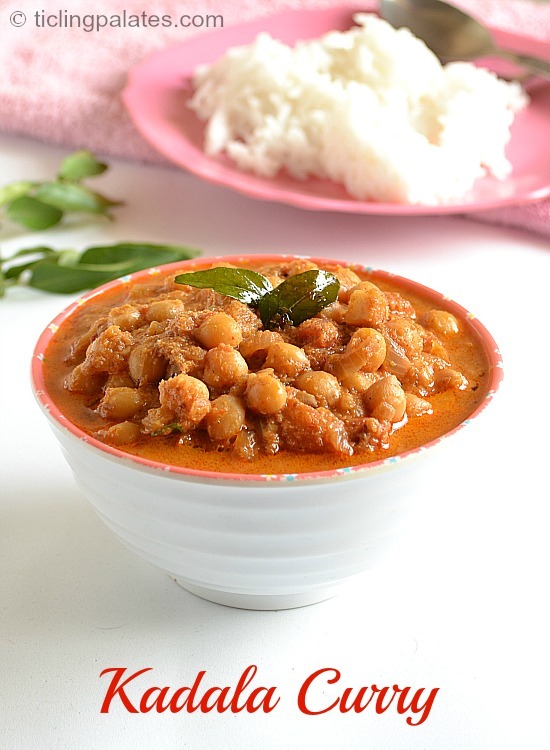 Take off stove and serve hot with steaming Puttu, Rice, Rotis or Chappathis. I have used the white colored Garbanzo Beans as my kids do not favor the black colored ones. Both taste the same though when used. Instead of whole spices used for grinding, you can also use the spice powders but the taste will remarkably vary. Use the standard variety of tomato instead of the hybrid variety. radhika, you ARE a STAR ! one day i m gonna sneak in and steal all that pink stuff!!! lip smacking curry Radhi! Looks delicious. 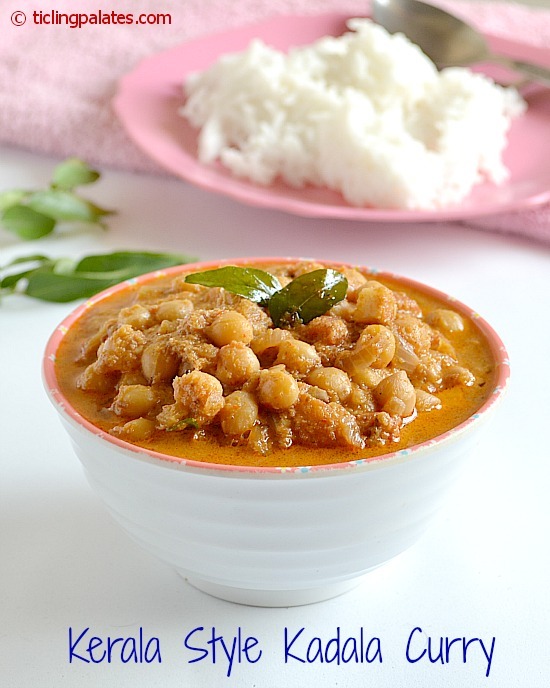 This is my favorite curry with Puttu. Puttu,kadala curry,love this combo very much,very tempting kadala curry. This is one of my favorites.. Looks delicious and nice pics.. This looks very delicious! Channa is always best with coconut, I think. A very good recipe , and it can be have with Rice or Chappati . But my favorite is Mughlai Paneer , its a very good curry dishes and also available online. Very nice and detailed recipe.very neat and clear pictorial explanation. It’s very useful for me.